Full Virus Scan: performs an in-depth scan of your system, checking all hard drives, rootkits, and auto-start programs. Targeted Scan: scans files or folders, similar to a Targeted Scan, but is only available from the Windows context menu when you right-click a selected file or folder in File Explorer or on your Desktop. Explorer Scan: performans a scan of folders or drives that you specify. This scan is only available in the Windows context menu. Boot-Time Scan: performs a scan of your PC for malware that is hard to reach after startup. You can determine the sensitivity of the scan by adjusting the scan sensitivity settings. The higher the sensitivity, the higher the protection and potential for false positive malware detections. Reducing the sensitivity reduces the chance of false positive detections, but may also reduce the effectiveness of the scans. Scan sensitivity is set to Medium sensitivity by default, but can be adjusted to High sensitivity or Low sensitivity. Scan sensitivity is customizable for Full Virus Scan, Targeted Scan, and Boot-Time Scan. Click and hold the white marker, then slide it to your desired sensitivity setting. 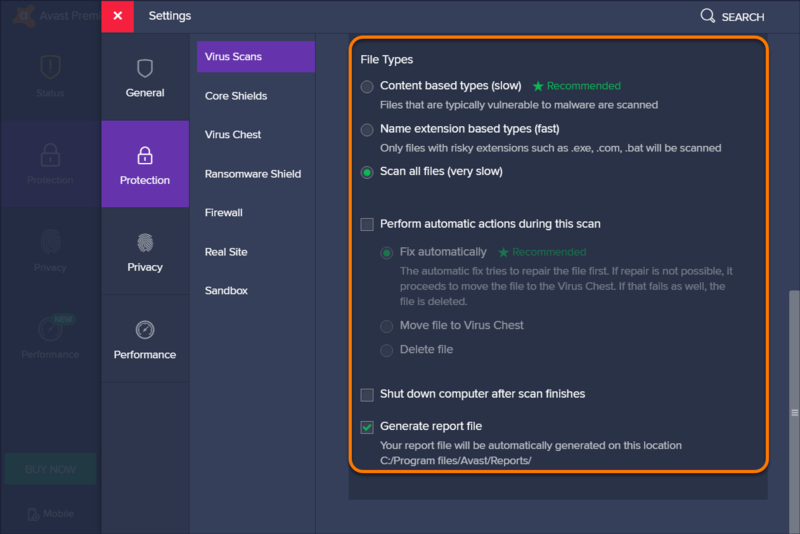 Scan for potentially unwanted programs (PUPs): enables Avast to scan for programs that are stealthily downloaded with other programs and typically perform unwanted activity. Follow links during scan: enables Avast to scan other files used by the files being scanned for potentially harmful content. Test whole files (very slow for big files): enables Avast to scan entire files rather than only the parts typically affected by malicious code. Use the drop-down menu to set your Scan priority (High priority by default). Use the drop-down menu to set your Scan priority (Medium priority by default). In this section you can determine the areas that are scanned on your PC. The Scan areas settings are only available for Full Virus Scan and Boot-Time Scan. All Harddisks: enables Avast to scan all hard drives on your PC. System drive: the options in this section apply to data that is stored on physical devices such as hard drives and USB sticks. All Removable media: enables Avast to scan applications that launch automatically when you insert a USB or other removable device into your PC. Scans of removable media, such as DVDs, may take a long time due to speed limitations. Rootkits: enables Avast to scan for hidden threats in the system. CD-ROM & DVD drives: enables Avast to scan CD and DVD drives for malicious content. Modules loaded in memory: enables Avast to scan applications and processes that launch after system startup or run in the background. Auto start programs: enables Avast to check all auto-start programs. Fix automatically: enables Avast to repair the infected file. If repair is not possible, the file is moved to the Virus Chest, and if that fails the file is deleted. Move file to Virus Chest: the infected file will not be repaired automatically, but will be moved to the Virus Chest. 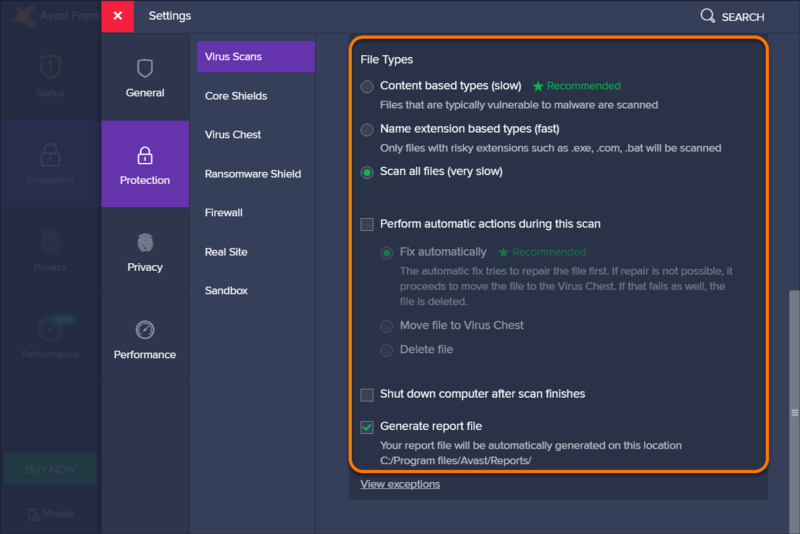 Delete file: Avast will not try to repair the infected file or move it to the Virus Chest, instead the file will be deleted automatically. In the Packers and Archives section you can specify the compressed file types that you want Avast to unpack during the scan. These settings are available for Full Virus Scan, Targeted Scan, and Explorer Scan. Scan most common used types: archive commonly used file types such as .zip, .rar, and other executable or installer archives. Scan all types of archives: the scan analyzes all archive files, which significantly increases the scan duration. Don't scan archives: disables Full Virus Scan from scanning archive files. Don't scan archives: disables Targeted Scan from scanning archive files. Don't scan archives: disables Explorer Scan from scanning archive files. Specify the file types that are prioritized when scanning your PC for malware. These settings are available for Full Virus Scan, Targeted Scan, and Explorer Scan. Content based types (slow): scans files that are typically most vulnerable to malware attacks. Name extension based types (fast): scans files with only risky extensions, such as .exe, .com, .bat. Scan all files (very slow): scans all files on your PC for malware. Shut down computer after scan finishes: enables Avast to shut down your computer after the Full Virus Scan completes. General report file: enables Avast to create and store a report file automatically. Shut down computer after scan finishes: enables Avast to shut down your computer after the Targeted Scan completes. Shut down computer after scan finishes: enables Avast to shut down your computer after the Explorer Scan completes. Although it is not recommended to exclude any files or folders from a scan, you can define certain exceptions to temporarily exclude particular files or folders from a Full Virus Scan or Targeted Scan for troubleshooting purposes. On the Exceptions settings screen, click the Add Exception button. 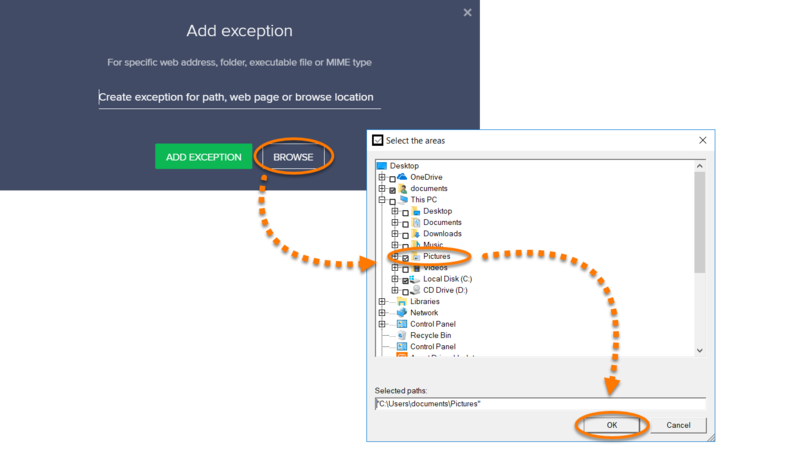 Type the specific file path or web address and click Add Exception. Optionally, click Browse, tick the box next to a file or folder you want to add to your exceptions, and click OK.